This hotel and residence offers the convenience of direct access to the Sukhumvit MRT and Asoke BTS train stations. 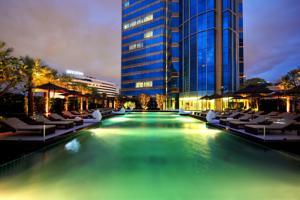 Providing free Wi-Fi and buffet breakfast, it features an outdoor pool and fitness facilities. Featuring modern interiors and warm lighting, the spacious rooms include a flat-screen cable TV and fridge. Well-furnished bathrooms have a hairdryer and toiletries. Offering free parking, Grande Centre Point Hotel & Residence Sukhumvit Terminal 21 is a 5 minute drive from Queen Sirikit Convention Center. It is a 5 minute BTS skytrain ride from Siam Paragon and MBK shopping centers. Guests have the use of a sauna, hot tub and meeting facilities. Added conveniences include a business center, laundry service and a 24-hour front desk. Hearty international meals are served in the stylish setting of Blue Spice or in the privacy of guest rooms. Free! One child from 1 to 4 years stays free of charge when using existing beds. Free! One child under 2 years stays free of charge in a baby beds. One older child or adult is charged THB 1500 per person per night in an extra bed. The maximum number of extra beds/baby beds in a room is 1. Additional fees are not calculated automatically in the total cost and will have to be paid for separately during your stay.